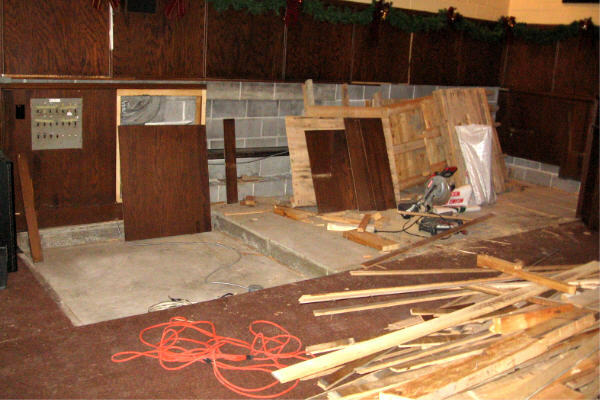 In November 2006, with a new organ scheduled for delivery in January 2007, the hitherto dormant Sanctuary Refurbishment Committee sprang to life. 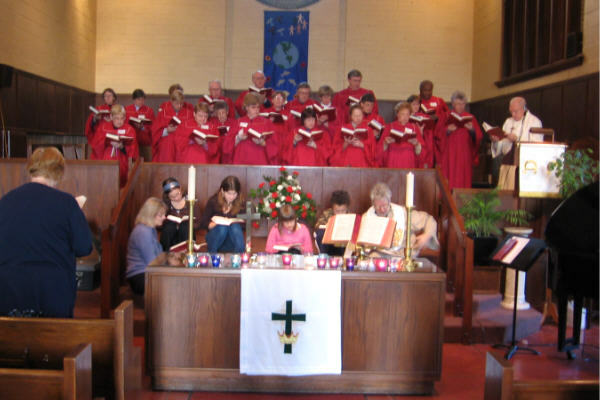 Under the leadership of Howard Clark, it was decided to re-arrange the chancel to have the choir facing the congregation, a long-standing wish of the choir. The project was undertaken between Christmas 2006 and January 6, 2007. With strawboss / do-it-yourselfer Howard directing, renovator Richard Legault and his helper Cam, together with Euan Crabb and some help from Matthew Legault and his friend began the demolition the Thursday after Christmas. 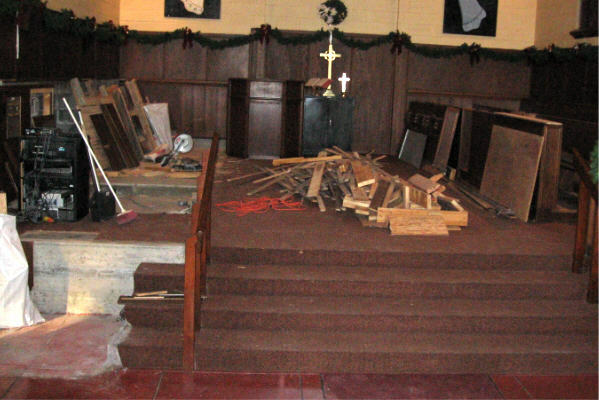 With the chancel partly demolished and the due date looming, Howard, Richard and Euan resumed work on Thursday, January 4 to finish the demolition and put the pews in their new position. On Saturday they put things together with additional help from Ian Mark, and Ruth Crabb trying to tidy things up in the face of the on-going dust generation. 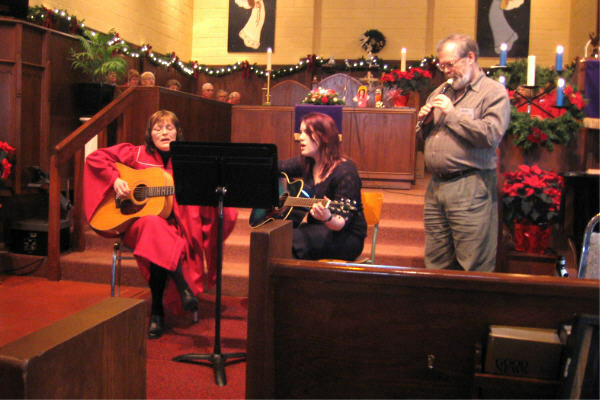 By early Saturday afternoon all was in place for Sunday service January 7. There remains much finish work to be done, but to the utter amazement of yours truly (and maybe those who did the work), the choir now faces the congregation and their voices can be heard much more clearly than before. Unfortunately your untrusty snapshooter did not organize himself to do before, during and after photos, so the shots below attempt to give some idea of what was done. These shots show the setup before the changes. First is a shot by Howard Clark, with no one present. 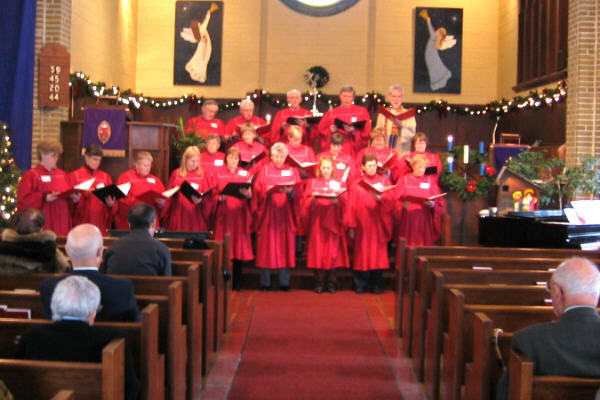 The second shows the choir on the steps, the pulpit at left. with the choir hidden behind at the two sides of the chancel. On January 3 your intrepid snapshooter came back from visiting family and had a look. Yikes! 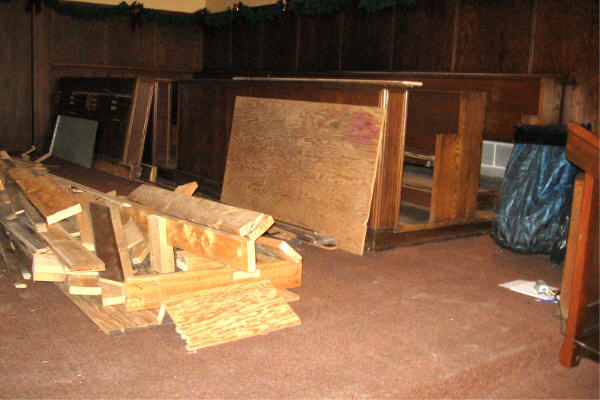 The pulpit is now at the back of the chancel and the west choir pews are demolished. 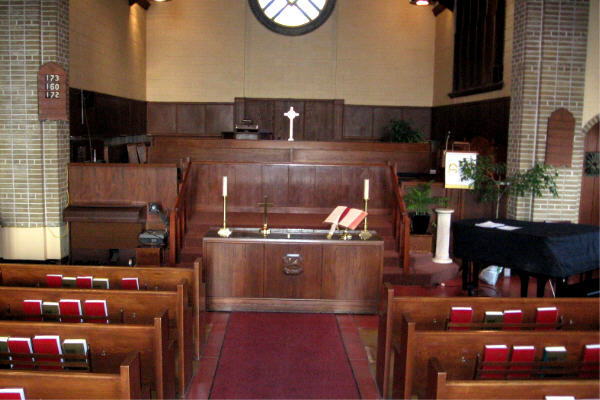 The east choir pews are still in place. 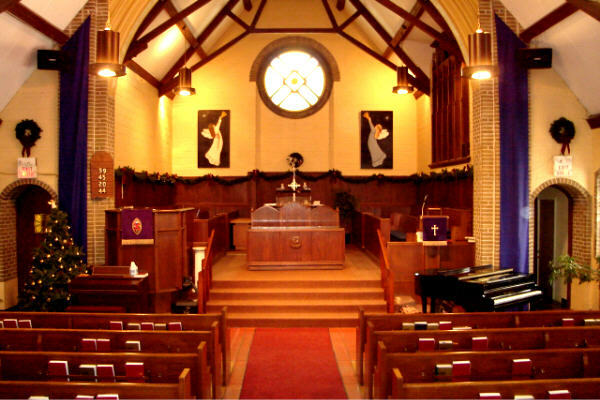 swung around to face the sanctuary, then pews re-installed. Just to give the P&M chairman apoplexy, nobody showed up Wednesday. Didn't know the plan was to resume Thursday. These guys sure are confident. This photo is a mockup prepared by Howard to show what he has in mind. with a bit of help from your intrepid snapshooter. Having progressed better than hoped, Friday was off to watch hockey. Then Saturday they put it all together with help from Ian Mark and Ruth Crabb. With the photographer thus occupied, no photos were taken while the work was in progress. 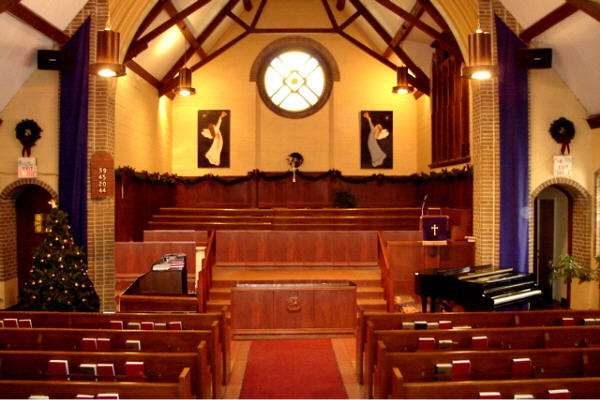 the chancel now looks similar to Howard's mockup photo. 3. The chancel after re-arrangement, looking dull in the dim light with the Christmas decorations gone. 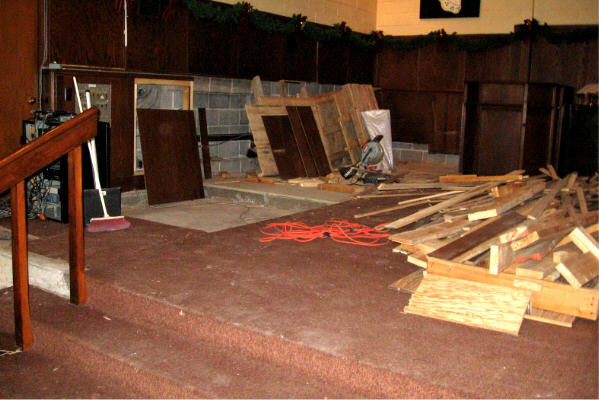 The small organ in place of the pulpit will be replaced by the new organ when it arrives. 1. 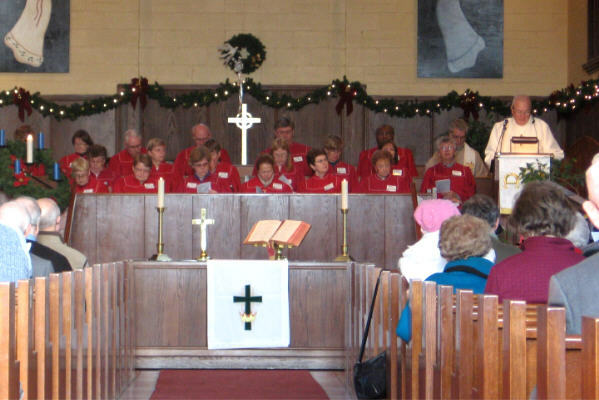 The choir seated in the new arrangement Jan 7, 2007, listening to Jeff Barlow. 2. The choir singing in the new arrangement Jan 14, 2007, young folk on the steps with Howard.